I love taking advantage of layovers/ short term visits / overnight stays so half a day in Colombo before an early morning flight to India was just perfect for me. I arrived around 1PM in the afternoon, put my backpack down in the Airbnb room and headed out on foot to explore a section of Colombo, Sri Lanka before getting a good night sleep for an early morning flight. I wandered out of the apartment and walked all around downtown. Passing shops, cafes, and parks and I ended my day with a cool glass of Rose at one of the nicest hotels in town – the perfect spot for my last Sri Lankan sunset. Talk about rest and relaxation during my time in Hikkaduwa. I would wake up around 8am, have my local Sri Lankan breakfast and walk down to the beach to grab a chair and enjoy the day! Hikkaduwa became my second home for several days while I rested my head (and legs!) and took some time off to relax at the beach before heading to INDIA! Hikkaduwa is located on the West Coast of Southern Sri Lanka and is just a 45 min train ride away from Galle, or around two hours from Colombo. I arrived via Kandy around 12pm after departing on the 5am train, threw down my backpack, and headed straight to the beach for a cold local beer and some sunshine. On the way back to Kandy from the Sigiriya Rock Fortress we stopped into the Dambulla Cave Temple. Dambulla consists of five sanctuaries that are literally built into large rocks. With over 150 statues and rooms filled with Buddhist mural paintings the space is spectacular and worthy of an hour visit on the way back to Kandy! Located in Central Sri Lanka, around a two hour drive from Kandy, lies Sigiriya Rock an ancient rock fortress in the middle of a flat landscape. I decided to take a day trip from Kandy with a driver who took me to and from with a few other stops in between. I spend several hours exploring Sigiriya and headed for the top of the rock as my first destination! The surrounding landscape of mountains and plains creates a beautifully dramatic viewpoint from the top of the rock at 180m. It was nice spending several days in Kandy with a lovely family from Air bnb. I really became a local during my time in the city and spent dinner with the family and walked to and from town each day. Kandy is centrally located in the country of Sri Lanka and is set on flat landscape surrounded by the mountains which makes for a lovely backdrop. There is a large lake in the center of the town and I stayed within a twenty minuite walk from the main part of town. It was nice to take a breather and really settle into Kandy for a few days (and going grocery shopping too!) before heading farther North to explore the ancient sights of Sri Lanka. Adams Peak, also known as Sri Pada and Sacred Footprint, was an amazing experience just outside of Hatton. 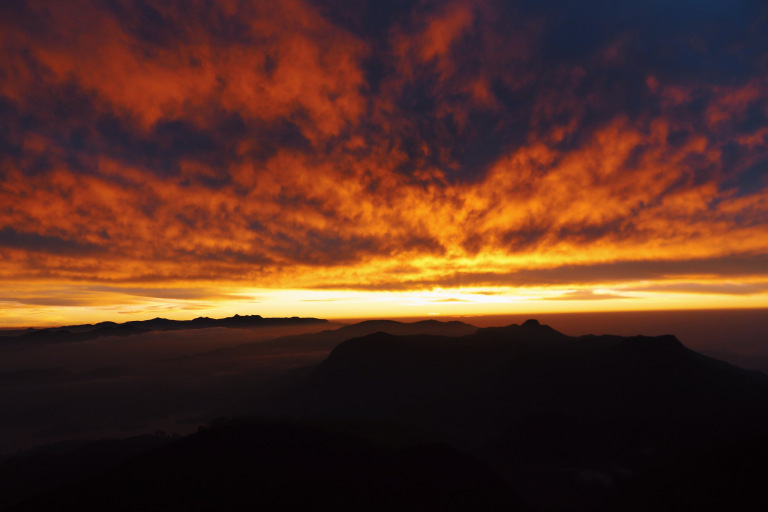 Those who wish to make the walk to the top of Adams Peak leave in the early morning to reach the summit just before sunrise. The mountain has been a place of pilgrimage site for hundreds of years and visitors and locals alike make the walk together. We left the tiny town around 2:30 AM and made it to the top just before 6:00 AM and watched the sun come up over the high Sri Lankan mountain range. Along the way we stopped for milk tea and coconut roti and celebrated alongside other walkers at our morning in the mountains! After the morning train ride we arrived into Hatton and were greeted by tons of eager tuk tuk drivers begging for our business. We decided to catch a ride with an older driver who promised us several pit stops along the way and a small narrative about the surrounding area. As we made our way from Hatton to Delhousie the driver showed us many sights along the way including an old English Church and a handful of colorful Hindu Temples. Once we arrived to Delhousie, the town where many stay to start their early morning pilgrimage to Adams Peak, we walked the small main street and relaxed at our little guest house before our 2AM wake up to begin making our way to the top! The best way to travel around the Hill Country of Sri Lanka is by train! The colorful trains chug along through the hillside, leaving the towns several times throughout the day. The trains make for a great adventure at very little cost to the traveler. We left Ella for Hatton on the early morning train and were able to grab a few snacks for the journey from the corner shop that opened first thing in the morning. If you miss out on the shops, no need to worry … there are local sellers coming on and off the train at every stop selling hot samosas and fresh fruits for the ride. I spent most of my time up off the train seat and standing in the doorway overlooking the tea plantations and waving to the locals as we moved past. Quite the adventure! Ella is filled with winding paths, rocky outcrops, and tea bush after tea bush …. and then even more tea bushes! We spent our first morning (after drinking tea) out in the hills making our way to Little Adams Peak, a beautiful uphill walk to several viewpoints overlooking the town of Ella and the surrounding landscapes.